Heading into the offseason, the Bolts had three main areas to address. 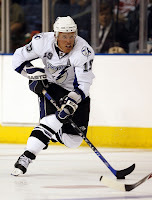 First they needed to sure up the defense, the bolts ranked 24th in the NHL in '06-'07. Second they needed to get some scoring help for Marty and Vinny, specifically on the second line with Brad Richards. His linemates Eric Perrin and Ruslan Fedotenko proved to be offensive disappointments, and both are now with othher teams. Finally, and most importantly, the needed goaltending. 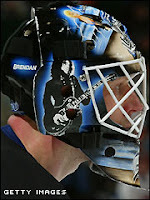 The Bolts spent most of the season playing musical goalies with Johan Holmqvist and Marc Denis, with Holmer eventually taking the #1 role. For Denis the season was forgettable. He posted a league worst 3.19 GAa and a .883 save percentage. To further add insult to injury, Denis was benched in the playoffs in favor of rookie Karri Ramo. The offseason saw the departures of Cory Sarich and Nolan Pratt. Sarich signed a lucrative deal with Calgary, while Pratt still remains unsigned. 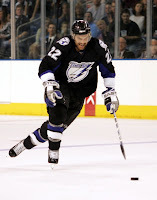 The Lightning brought back former Bolts defenseman Brad Lukowich. They re-signed Shane O'Brien who they acquired at the trade deadline from Anaheim. That's it. No other moves were made, and although the signing of Lukowich was a good move, it may not have been enough to sure up a shaky defense. The 6th defenseman spot was up for grabs come training camp, and the battle was between Janik, Smaby and Lundin for the spot. All three are on the opening night roster, and more than likely 2 of the 3 will stick beyond the beginning of the season after the return of Dan Boyle who is recovering from surgery to repair ligaments in his wrist that were cut by a freak accident with a skate blade. The move that was made that may make the most difference with the defense was the firing of Assistant Coach Craig Ramsey, and the hiring of Mike Sullivan. Expect to se a more agressive defensive style played this season with less backing in from the blue line, and with more shots form the point. The Bolts first line seemed to run out of gas in last seasons first round playoff matchup with the Devils. Torts was forced to ride those horses into the ground. This season they will need some help if the Bolts are to get out of the first round. There is no question Brad Richards didn't perform up to his $7.8 mil cap number last season. He knows it, management knows it and fans know it. The Conn Smythe winner had a down year in '06-'07, partly due to the departure of Fredric Modin to Columbus and Cory Stillman to Carolina. Without Modin and Stillman on his wings, Richards struggled to find a rhythm, and with new linemates Eric Perrin and Ruslan Fedotenko, only mustered up 70 points. To address this problem, Feaster went out and got a former Junior teammate of Richards from his days in Rimouski, Michel Ouellet. Ouellet was left unprotected by Pittsburgh in the offseason, and hoping spark the second line, Feaster snatched him up to pair with Richards. Along side Richards and Ouellet will be Jan Hlavac. Hlavac last played in the NHL in '03-'04 with the Rangers. He has spent the last couple of seasons in the Czech and Swiss elite leagues honing his game. The Bolts are hoping he can get back to the form he had early in his career with the Rangers where he put up 64 points in the '00-'01 season. 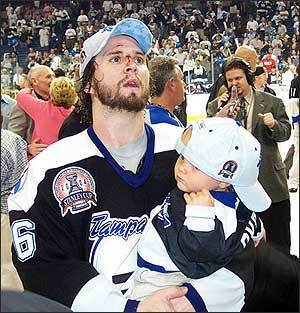 Perhaps the best pickup this off season was former Lightning first round draft pick Chris Gratton. He will be paired up with Andreas Karlsson and Jason Ward, and aside from adding some needed grit, should provide some good minutes and chip in a few points. Keep an eye on Vinny Prospal. This is a contract year for him, probably his last chance to land that big money deal. He worked out hard in the off season and has looked good in camp. A rejuvenated Prospal would be a welcomed site! Ah yes, the ole' goalies. Perhaps the most talked about subject this off season. And for good reason. When you bench your $2.8 million, supposed #1 for the playoffs in favor of 2 rookies, there's bound to be talk. Marc Denis hardly lived up to his #1 goalie billing, putting up a league worst 3.19 GAA and a .883 save percentage. He was supplanted as the Bolts #1 by rookie Johan Holmqvist heading down the stretch. In what seemed to be a bizarre move, Denis was watching from the press box, as another rookie, Karri Ramo, took his roster spot for the playoffs. The move left everyone in Tampa wondering what was going to happen in the off season. Obviously Denis was done in Tampa, right? Oh contraire' monfraire'. Heeeees Baack. With no trade value since his benching, the Bolts were left holding the bag with Denis. They had two choices; bring him back and let him compete, or cut him and eat $900k for the next 4 years. The Bolts have chosen to keep Denis, but is it because they have faith he can rebound, or merely to get his value back up a bit in hopes someone will show interest? I feel it is the later, but what do I know? This coming season the Bolts will field the same two guys in goal as last season, just with their roles reversed. If Saturday's loss in Dallas is any indication of Denis off season progress, look for Ramo to be in the line up early in the season. Not to beat a dead horse, but this season comes down to the guys between the pipes. Defense wins championships, and when it comes to hockey, the last line of defense is the goalie. If these guys don't improve on last season's numbers, it could be a long season here in Tampa. If Holmer takes that next step, the defense improves and someone other than Marty and Vinny can score, the sky's the limit. A whole lotta "if's" to go into a new season with, it will be interesting to see how it all plays out. After being named to the Lightning roster, Marc Denis promptly gave up 4 goals on 14 shots to close out the preseason in Dallas. The lone Lightning goal came from Shane O'Brien. Holmqvist came in mid-way through the second, as scheduled, and only gave up on goal, on a power play. Igor Grigorenko and Tomas Kopecky scored shootout goals to give the Detroit Red Wings a 3-2 win over the Tampa Bay Lightning on Thursday night. Jan Hlavac scored the lone goal for Tampa Bay in the shootout. Mattias Ritola, and Valtteri Filppula had Detroit's goals in regulation, and Chris Osgood made 19 saves for the Red Wings. 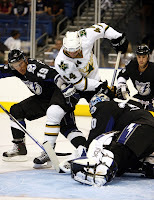 Matt Smaby, and Michel Ouellet scored for the Lightning, and Johan Holmqvist stopped 27 shots. Smaby scored 2:58 into the second period to tie the game 1-1. Filppula's power-play marker 5:28 into the second period restored Detroit's one-goal lead. Ouellet re-tied the score 2-2 with 1:16 left in the second. Ritola's power-play goal opened the scoring 5:05 into the game, when he put in a rebound. He was cut under the right eye by a puck with a little under nine minutes left in the first period and did not return. We have more to celebrate than just the start of training camp today. According to The Globe and Mail, hockey fans in the United States may soon be able to receive the NHL Network. No word on which cable or satellite systems will be picking up the network. Also mentioned in the article is the possibility of another Super Series, this time between Canada and the United States. A tap of the stick on the ice to Paul Kukla for the assist. Not sure when or if it will be available here in the bay area, but I imagine if it is, it will be part of a sports package tier on Bright House or Verizon. Start making your calls to request your provider carry the NHL Network. It's going to have games, highlight shows, draft specials, and more! What are you waiting for, go make those calls!!!! Martin St. Louis scored two power-play goals to lead the Tampa Bay Lightning past the Detroit Red Wings 4-3 in a pre-season game Monday night. St. Louis tied it 2-2 on his first goal, coming midway through the first. His second put Tampa Bay ahead 4-2 at 14:39 of the second. Andre Roy and Andreas Karlsson also scored for the Lightning. Karri Ramo had 20 saves. Detroit got goals from Jonathan Ericsson, Johan Franzen and Brett Lebda, who scored with 3:31 left in the third to make it 4-3. Chris Osgood played two periods and stopped 14 of 18 shots. Tampa Bay was without Vincent Lecavalier, who led the NHL with 52 goals last season. The centre left Saturday's game against Washington with an upper body injury. 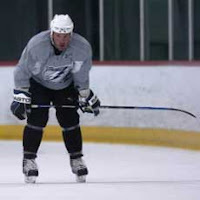 Others sitting out for the Lightning included forwards Chris Gratton (eye), Michel Ouellet (strained hamstring) and Ryan Craig (herniated disc), and defenseman Dan Boyle (wrist surgery). The D & Ramo looked a little shaky early giving up 2 goals in the 1st 5 minutes. But Roy came to the rescue, scoring the Bolts first goal, and then dropping the gloves at the next face-off with the Wings Aaron Downey. That was followed by a Nick "Nasty" Tarnasky vs. Neil Clark fight. The Bolts seemed to gain momentum at that point, and never looked back. St Louis tallied 2 power play goals, including one during a 5 on 3. They chased Wings goalie Chis Osgood after 2 periods, and locked it down until Detroits 3rd goal late in the 3rd period by Brett Lebda. In all, a good outing by the Bolts. Defenseman Dan Boyle is through his surgery on his left wrist. As it turns out, three completely severed tendons were successfully repaired following the freak accident in the locker room last night in which a falling skate cut his wrist. The surgery took place at University Community Hospital today and was performed by team physician Dr. Ira Guttentag and hand specialist Dr. Richard Gray. Boyle, the team's top defenseman, is expected to be out 4-6 weeks. Six players were sent to the Norfolk Admirals training camp following the game, reducing the Lightning roster to 27 heading into Monday’s game against Detroit. The cuts were D Dan Jancevski, F Blair Jones, D Jay Leach, F Norm Milley, D David Schneider, F Karl Stewart. Vinny skated this morning, but is being held out for precautionary reasons. Gratton still out with the eye. Craig is out with back spasms. Roy, Hlavac and Ward seem o.k as they are in tonight's line-up. Obviously no Boyle for a while. Torts thinks he'll be back in 4 weeks max. Tampa, FL (Sports Network) - Alexander Semin broke a 1-1 tie less than two minutes into the second period to give the Washington Capitals a 2-1 win over the Tampa Bay Lightning in preseason action. Dave Steckel scored the other Washington goal, and Brent Johnson saved 18 of 19 shots for the Capitals. Martin St. Louis tallied for Tampa Bay, assisted by Vincent Lecavalier and Dan Boyle, and Johan Holmqvist stopped 18 of the 20 shots he saw in net. Tampa Bay Lightning defenceman Dan Boyle will undergo surgery on Sunday following a freak accident at the end of Saturday's 2-1 pre-season loss to the Washington Capitals. Boyle was injured in the Lightning locker room when distracted while hanging up his skates. A skate slipped off of the hook and hit him in his left wrist, cutting a tendon. He'll have surgery on Sunday and will be out of action for several weeks. Also injuried in the game was Lightning centre Vincent Lecavalier, who left in the second period with an undisclosed upper body injury. Boyle, set to become an unrestricted free agent next summer, is coming off a career-high season where he put up 63 points (20 goals, 43 assists). TAMPA, Fla. (AP) - Mathieu Darche scored at 4:40 of overtime to lift the Tampa Bay Lightning to a 4-3 pre-season victory over the Dallas Stars on Wednesday night. Brad Richards, who had three assists, set up the winner. Tampa Bay took a 3-2 lead when Kyle Wanvig scored on a third-period penalty shot. Dallas' Loui Eriksson tied it with a power-play goal with 1:01 left in regulation. Marc Denis, looking to rebound from a disappointing season in which he went from being the Lightning's No. 1 goalie to not making the post-season roster, stopped 36 shots. Andreas Karlsson and Jason Ward, who scored on the power play, had the other Lightning goals. Denis looked pretty good last night, except for the Stars first goal that went up and over his shoulder. He seemed to loose sight of it. Other than that he had a pretty solid performance making 36 saves. I'm still not sure what to think of the defense. Granted Lukowich,Boyle and Ranger didn't play so I can't be too hard on them. There were quite a few blocked shots, I attribute to the more agressive style Sullivan is trying to implement. The most glaring highlight was the play of Brad Richards. He assisted on 3 of the Bolts goals including the game winner in OT by Darche. Richie looks like he is hungry and back on track. In all a solid 1st game by the Bolts. Lightning win 4-3 in Overtime, Darche gets the game winner. Here are the lines the Bolts are going to roll for the first preseason game vs. Dallas. No MVP line, no Holmer, Lukowich, Boyle. Hlavac & Roy are nursing injuries. Hlavac to a shot to the foot, Roy while skating backward was pushed into an open doorway by the bench and hurt his lower back. Ouch. Should be interesting to see how the Richards line is/is not gellin'. Looks like it is going to be a battle between Denis/Ramo for that #2 goalie. Sean Burke, an accomplished veteran of international and professional hockey, officially announced his retirement today from the National Hockey League. Drafted 24th overall in the 1985 Entry Draft, Burke, 40, broke into the league near the end of the 1988-89 season with the New Jersey Devils, after participating in the 1988 Olympics. He proceeded to lead them to the playoffs for the first time since the franchise moved to New Jersey, with a 10-1-0 record down the stretch. Behind Burke’s brilliant play, the Devils reached the Wales Conference final that year, solidifying Burke as a steady and reliable goaltender in the NHL. In total, Burke played for nine different NHL teams over the course of his career. After leaving New Jersey, he would suit up for Hartford, Philadelphia, Carolina, Vancouver, Florida, Phoenix, Tampa Bay and Los Angeles. In each of these cities, he was a team leader and a key contributor to the success of the franchise. His career highlights include: being the runner-up for the King Clancy Trophy for excellent play and humanitarian contributions in 1993-94; playing in the 1989, 1995 and 2002 NHL All-Star Games; and, finishing as a finalist in voting for the Lester B. Pearson Award in 2001-02. Burke finishes his career with 820 games-played, which ranks him 12th all-time amongst goalies, 6th all time on the career shutouts list (38) and 19th all time in career wins as a goaltender (324). I was able to make it out to camp today and see Team White beat Team Black 2-1. Scoring for the Black was Prospal, for the White it was Ward and Gratton. I must say, I was impressed by what I saw out of Ramo stopping 13 of 14. He may just be playing his way to a roster spot. The kid looks strong between the pipes, and is not intimidated a bit. He looks like he follows the puck really well and has good reflexes. Problem for Ramo is, neither Holmqvist or Denis seems willing to give that second spot up. Holmer and Ramo played the majority of the time, over 30 min each, Denis came in here and there, and logged about 20 minutes. Through 3 days of scrimmages, here are the goalie stats: Marc Denis, 0.74 gaa, 35 saves on 36 shots, .972; Karri Ramo, 1.35 gaa, 45 saves on 47 shots, .957; Johan Holmqvist, 2.72 gaa, 34 saves on 38 shots, .895. Also standing out was Vinny Prospal. It looks like he is ready to be a bigger contributor to the first line. He is skating strong, forechecking well, and scoring. It appears his offseason workouts have payed off. Vinny Lecacalier and Marty St. Louis looked like they haven't missed a beat, and seem to be in mid season form. On defence, nothing really stood out. Doug Janik was skating really well, but got stripped by Lecavalier in the zone, and the turnover led to a scoring chance. The sixth spot still seems to be up in the air. I shot a bit of video, a little primer before Wednesday's preseason opener against Dallas. Enjoy! 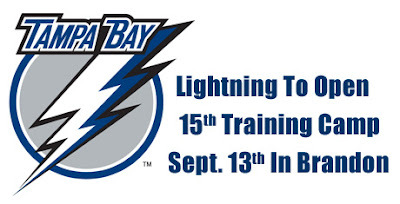 The Tampa Bay Lightning will open their 15th training camp on Thursday, Sept. 13 at the Ice Sports Forum in Brandon. Players will report to Brandon on Sept. 13 for physicals and testing, and they will undergo additional testing on Friday, Sept. 14. Saturday, Sept. 15 will be the first day of on-ice scrimmages and practices. Thursday, Sept. 13: Physicals and testing begin (Brandon), 9 a.m.
Friday, Sept. 14: Physicals and testing continue (Brandon) 8 a.m.-1:30 p.m.
Saturday, Sept. 15: Team scrimmages and practices begin (Brandon), 10 a.m.
Sunday, Sept. 16: Scrimmages and practices (Brandon), 10 a.m.
Monday, Sept. 17: Scrimmages and practices (Brandon), 10 a.m.
Tuesday, Sept. 18: Scrimmages and practices (Brandon), 10 a.m.
Wednesday, Sept. 19: Pre-game skate (Brandon) 10:30 a.m.
Preseason game vs. Dallas, St. Pete Times Forum, 7:30 p.m.
Thursday, Sept. 20: Practice (Brandon) 12 p.m.
Friday, Sept. 21: Practice (Brandon) 10 a.m.
Saturday, Sept. 22: Pre-game skate (St. Pete Times Forum) 10:30 a.m.
Preseason game vs. Washington, St. Pete Times Forum, 7:30 p.m.
Monday, Sept. 24: Pre-game skate (St. Pete Times Forum) 10:30 a.m.
Preseason game vs. Detroit, St. Pete Times Forum, 7:30 p.m.
Tuesday, Sept. 25: Practice (Brandon) 10 a.m.
Wednesday, Sept. 26: Practice (Brandon) 10 a.m. Team charter to Detroit, 1 p.m.
Thursday, Sept. 27: Pre-game skate, 11:30 a.m.
Preseason game at Detroit, 7:30 p.m. Team charter to Dallas, 1 p.m.
Saturday, Sept. 29: Pre-game skate, 11:30 a.m.
Preseason game at Dallas, 7 p.m.
Erlendsson is reporting that Vladimir Mihalik was supposed to be in camp, but has just been told to report directly to Norfolk. In his place will be David Schneider. NHL.com -- Were you a little surprised at what happened with your goaltending last year? Feaster -- Yeah, we were a little surprised. A pleasant surprise in that Johan Holmqvist had a great year. He won 27 games. He's back on a one-year deal. We're excited about that because he acknowledges that he has things to accomplish. Going into camp, he's the No. 1 guy. We'll take three goalies into camp. Marc Denis has to have a bounce-back year and we're confident that he will. He learned a lot of things last year. He dealt with a lot of things that he didn't have to deal with before in terms of the way John holds his goaltenders accountable, just like every other player on the team. I think Marc will bounce back. Then we have the youngster, Karri Ramo, who Bill Barber and all our scouts and minor-league guys have said is ready to play as a backup right now in the NHL. So, those three guys will come into camp fighting for two spots. "I think we're deeper now than we've been at any point since the 2003 Stanley Cup Final." NHL.com -- Would Ramo benefit from another year in the AHL? Feaster -- I don't think there would be anything wrong with that. In fact, that would be a good thing for him. But we're not going to hold him back. If he winds up one of the two best goaltenders, we'll move him along. NHL.com -- Was Denis' main problem a cultural change from one organization to another? Feaster -- I think so. Honestly, because of the way we work, the goalies are just as accountable as the position players. If you don't have a good game, “Torts” is going to take you out and he's not going to come with you if the other guy is playing well. That's one of the things that happened. Marc struggled a little bit and we put “Homer” in there and he took the ball and ran with it. I do think it was a bit of a cultural change for Marc. I know this is a hockey blog, but I gotta give props to my alma-matter. 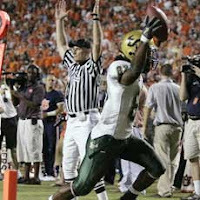 The USF Bulls notched another big win for the football program last night taking it to #17 Auburn on the road. The Bulls came away with a 26-23 overtime win on QB Matt Grothe's 21st birthday! GO BULLS!